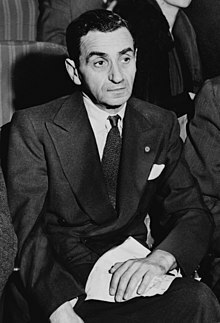 Irving Berlin (May 11, 1888 – September 22, 1989), born Israel Baline, was an American songwriter. Berlin's first popular success was "Alexander's Ragtime Band." In 1938, Kate Smith made "God Bless America" a popular hit. In 1942, Berlin won the Academy Award for the best original song in the movie "Holiday Inn". The song was "White Christmas.". Bing Crosby recorded the song. This became "the best-selling record of all time." Broadway musicals written by Berlin included "Annie Get Your Gun" and "Call me Madam." ↑ 1.0 1.1 1.2 1.3 1.4 Barol, Bill. "Irving Berlin: 188-1889," Newsweek. October 2, 1989, p. 75; retrieved 2011-12-29. ↑ Harris, Roy J. "Irving Berlin's White Christmas," Wall Street Journal. December 11, 2009; retrieved 2011-12-29. Wikimedia Commons has media related to Irving Berlin. This page was last changed on 14 November 2018, at 00:34.